This year we didn’t have time to test our drive train on the actual robot with everything functioning. But on our practice robot everything was running smooth. The moment we went on our first regional to our surprise the robot jitters everytime it tries to turn making it ineffective to hold a hatch panel. On driverstation it shows that it’s drawing around 140 amps on one side of the drive train. The robot is 120 pounds, 3 mini cims per transmission. 13 motors in total (combination of mini cims, 775 pros, bag motors) six 8" pneumatic wheels. We ended up using TalonSRX to limit the current to 40 amps as peak current threshold it definitely made the driving smoother but driving was really slow. This never happened on the practice robot, but then again we never drove on carpet. Any thoughts? Have you checked to make sure all the motors on each side are spinning in the right direction? If the motors are fighting each other that would draw a lot of current. It could be a PID issue, different pid values needed for your comp bot. But I would definitely check the motors in the code and electrically. Is your drop center too low? If it is all six wheels could be scrubbing on carpet and causing massive current use. If the wheels are under inflated it could cause the same problem with too much friction while turning and driving. From experience with pneumatic wheels in 2016, I think that turning scrub could be significant and I may expect a difference between ease of driving on carpet versus on a non-carpeted surface. What is your wheel-base configuration and do you have a drop-center? With pneumatic tires you might also want to check the pressure in the wheels as your effective drop center may be more or less than intended based on tire inflation. Other suggestion I would have is to check wires to and from battery for any loose connections. I would run each of your drive motors independently (just unplug the others from the PDP for a moment) and make sure that they are all in fact going the same way – if they’re not, it’s a fast fix to swap the wires coming out of the Talon. But my suspicion with 8" pneumatic tires is scrub on the carpet, as Jen suggests. You can increase your effective drop center a little bit by making sure your center tires are really well inflated and your corner tires are a bit soft – this isn’t ideal, but it’s at least easy to try. Neither of the latter two suggestions are great, but they’re likely a lot easier and faster than trying to actually drop the center wheel – but even if you have the time to do things right, both of those are easy tests to see if it is, in fact, wheel scrub that’s your problem. And if it is, and you have the time, then you can lower that center wheel by enough to matter. On driverstation it shows that it’s drawing around 140 amps on one side of the drive train. The robot is 120 pounds, 3 mini cims per transmission. 13 motors in total (combination of mini cims, 775 pros, bag motors) six 8" pneumatic wheels. We ended up using TalonSRX to limit the current to 40 amps as peak current threshold it definitely made the driving smoother but driving was really slow. This never happened on the practice robot, but then again we never drove on carpet. Any thoughts? Don’t use current limiting to fix problems like this. The current draw is not the problem, it is just a symptom. This is, 100%, a mechanical problem. The key here is that one gearbox is pulling much more current than the other, and that it isn’t happening on the practice robot. Something is binding in that gearbox. Take it apart, check to make sure all gears are pointed the right way, everything is tightened down correctly, properly aligned, etc. It also could be a completely dead or disconnected motor, but that is less likely. What gearbox are you using? Is this the Kitbot? We can tell you about potential assembly errors in COTS gearboxes if we know which kind it is. Other suggestions about software, turning scrub, drop center, etc. could be relevant if they were happening on both robots, but it isn’t. This is mechanical, I’m sure of it. Focus on the high current gearbox and figure out what the mechanical inefficiency is caused by. EDIT: Just realized you never drove the robot on carpet - turning scrub could also be a factor. What is the current draw when it is on the bench? It will draw less current with no load no matter what - but if it’s like 40+ amps instead of 10ish amps that still tells you something. @Mahim jitteriness is usually (in my own experience) a result of brownout conditions or a CAN issue. Pull up any driver station logs for voltage, packet loss, and CAN errors. This will narrow the focus of your investigation. 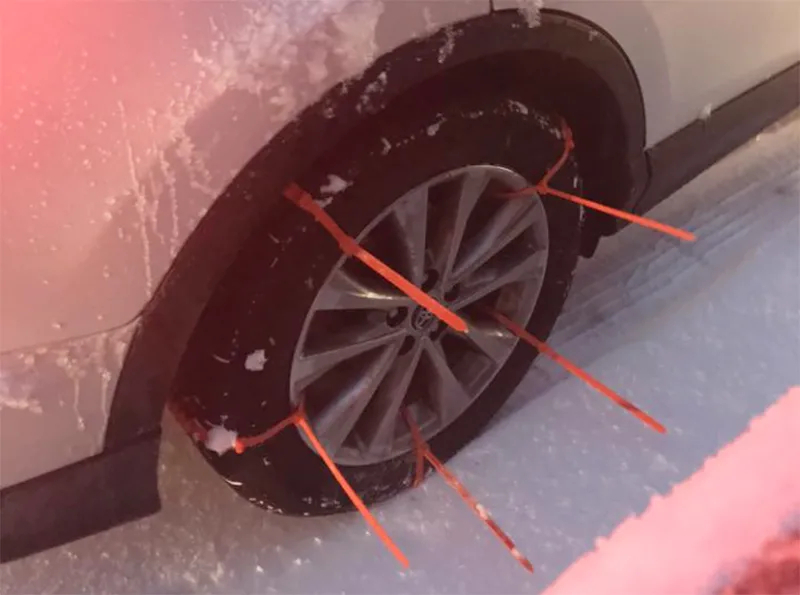 The super old school trick is to put zip ties on the wheels. This lets the wheels slide side-to-side but the edge of the zip ties can still generate reasonable forward/backward traction. Don’t put the head of the zip ties in contact with carpet though, that’s a good way to damage the field. Run the 2 center wheels at a high inflation pressure, say 35 psi. Distribute the robot weight so most of the weight is on those center tires. I will definitely let the rest of the team know to check and take the transmission apart, we are using 3 cim ball shifters for both the practice robot and the actual robot. If that doesn’t fix it we might just switch out the side wheels to Omni wheels, and might change them to 6". Will keep updated on how that goes. The fact that the issue only occurs on turning indicates to me that it is an issue with the mechanism itself. You mentioned your center wheel being raised. It should be dropped. Can you upload some pictures of your drivetrain? How long is your drivebase? I will definitely let the rest of the team know to check and take the transmission apart, we are using 3 cim ball shifters for both the practice robot and the actual robot. I’m putting $1 on the shifter on one side is defaulting to high gear and low on the other.